Watch for This Sign After Jicotea. Turn Right. You'll See the Big Rock, VEREH. Backpacker's Map From Jicotea To Camping Reserve. 10K Hike From Jicotea. 5mile Hike From The Rock. Even though the road is only dirt and rocks, a bus comes every M.W.F. Self Guided Transport - Busses only cost a few dollars but they are a big challenge to find. If you are savvy with the CR Bus system you can purchase tickets, San Jose to Turrialba, online at http://transtusacr.com. At the airport the bus is found by walking off the airport grounds and looking on the side of the road for the bus shelter. Take the airport bus to the central station in San Jose. Then take a taxi to the Turrialba Bus station at 6th Avenue and 13th St., Calle 13. You can purchase a ticket at that location or on line beforehand. Be vigilant, watch your wallet. keep focused on the people around you when buying your ticket. Board the bus and off you go to Turrialba. The ride takes about 3 hours. The bus lets you off in Turrialba at the main depot. You'll find the bus to Vereh by walking down hill into the center of town (about a 15 min walk). From Turrialba to the Reserve by bus or taxi take about 1 hour and 15 minutes. A 4x4 taxi from Turrialba to The Reserve costs ¢25,000 colones. You can call Don Rene, he drives a 4x4, ph: 8666-7928. Best to phone or email Don in advance. When you are making your reservations with me I can give you his email. On M.W.F. there is a Special VEREH bus leaving Turrialba at 2:00 from the center of town close to a gas station: Aveninda 2, between Calle0 and Calle 2. You can get the Jicotes bus any day but it only goes as far as Jicotea. From there you will have a long, hard, beautiful hike for 10miles. The local, Vereh bus only runs M.W.F., costs ¢2,000 colones (about 4 US dollars) one way and comes to La Cruze, that's one mile from The Camping Reserve. You can leave Vereh by this bus on M.W.F. at 7:00am. Once you have reached The Cruze (the T in the road) in Vereh get out, follow the sign to your right for one mile. When hiking from the ricotta bus go straight at first. You'll come to a fork with some big brown signs pointing to a Restaurant. Go towards the left fork. Turn right at the sign for Vereh, The Rock, which you can't actually see until you’ve made the turn. GPS Coordinates: Longitude and Latitude are, 9.777683, N and 83.518232 W. 66XRQFHJ+3P. The locals hike this far all the time! You Can Do It! THE SOLID RED LINES SHOW THE CAMPGROUNDS. IT TAKES 10 HARD HIKING DAYS TO REACH THE BORDER OF PANAMA. THERE ARE NO ROADS OR TOWNS BETWEEN US AND THE BORDER. In this topographical map (top of the map) you can see several towns along the red dashed road: Tayutic (Platanillo), Jicotea. 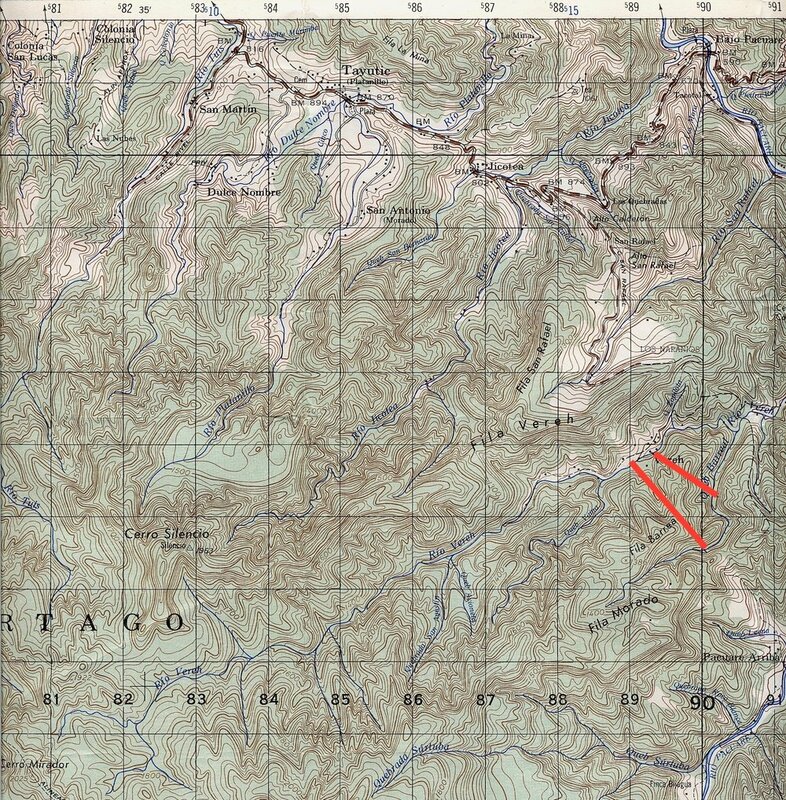 Then the dashed line crosses Rio Jicotea and shoots up. Before Rio Jicotea a smaller, red, dashed road makes a hard right. This is your turn where you'll see the landmark rock pointing to Vereh.